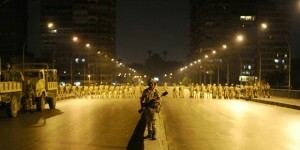 Egypt’s interim government was accused of attempting to return the country to the Mubarak era on Monday, after the country’s interior ministry announced the resurrection of several controversial police units that were nominally shut down following the country’s 2011 uprising and the interim prime minister was given the power to place the country in a state of emergency. Egypt’s state security investigations service, Mabahith Amn ad-Dawla, a wing of the police force under President Mubarak, and a symbol of police oppression, was supposedly closed in March 2011 – along with several units within it that investigated Islamist groups and opposition activists. The new national security service (NSS) was established in its place. But following Saturday’s massacre of at least 83 Islamists, interior minister Mohamed Ibrahim announced the reinstatement of the units, and referred to the NSS by its old name. He added that experienced police officers sidelined in the aftermath of the 2011 revolution would be brought back into the fold. Police brutality also went unchecked under Morsi, who regularly failed to condemn police abuses committed during his presidency. But Ibrahim’s move suggests he is using the ousting of Morsi – and a corresponding upsurge in support for Egypt’s police – as a smokescreen for the re-introduction of pre-2011 practices. Ibrahim’s announcement came hours before Egypt’s interim prime minister was given the power to place the country in a state of emergency – a hallmark of Egypt under Mubarak. “It’s a return to the Mubarak era,” said Aida Seif el-Dawla, a prominent Egyptian human rights activist, and the executive director of a group that frequently supports victims of police brutality, the Nadeem centre for rehabilitation of victims of violence and torture. Karim Ennarah, a researcher on criminal justice and policing at the Egyptian initiative for personal rights (EIPR), said the units were never disbanded. But he said that Ibrahim may be using the current support for the police as a excuse for their public rehabilitation. Hatred of the police was a major cause of the 2011 revolution, while their reform was one of its implicit demands. But the police’s obvious enthusiasm for Morsi’s fall has helped to rehabilitate them in the eyes of many. Uniformed officers were seen carrying anti-Morsi propaganda in the run-up to his departure, while police failed to protect the offices of Morsi’s Muslim Brotherhood. On Friday, hundreds of thousands of Egyptians filled streets across the country to show their backing for the army and the police – after General Abdel Fatah al-Sisi, the army chief who forced Morsi from office on 3 July, asked for their backing to fight what he termed as terrorism. Ibrahim’s announcement the next day hinted that he felt he had implicit public support for a crackdown on not just terrorists but religious and secular activism of all kinds. “Our pride is back,” one middle-ranking Cairo-based police officer told the Guardian, adding that state security’s notorious treatment of detainees was reasonable given that, in his view, the detainees were unlikely to be innocent. “Ninety per cent of the people I’m dealing with are guilty – so I will not deal with them nicely. I have to be tough, I have to be rough. And that’s how state security behave – because 99% of the people they are dealing with are guilty. “If you haven’t done anything wrong, you have nothing to fear. The only people who should fear are the guilty ones – the ones who steal, the ones who kill, the ones who do deals with other countries. Like Morsi, who dealt with Hamas – and who wanted to sell Sinai to America,” the officer added, referring to as-yet-unproven allegations that ex-president Morsi colluded with Palestinian Islamist group Hamas during the 2011 uprising. While the police and army enjoy widespread support among the millions of Egyptians who called for Morsi’s overthrow, a few Morsi opponents have refused to back the army’s renewed involvement in politics, and the corresponding return to favour of the police. A new protest movement called the Third Square has begun to assemble in a square in west Cairo – rejecting the authoritarianism of both the army and Morsi’s Muslim Brotherhood, and calling for a return to the true democratic values of the 2011 revolution. “Down with the Murshid [the Brotherhood’s leader], down with military rule. No to the killers in state security,” chanted around 75 Third Square protesters on Sunday night.